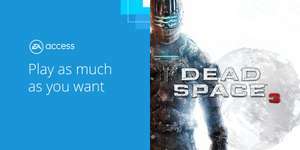 Dead Space 3 now available on EA Access/Origin Access. Dead space 1+2 were brilliant games. Waiting for a remastered boxset. True, but I still managed to enjoy it. Not a patch on the first two though. who the fk has ea access lol? Why on earth would you do this? they have ruined every franchise theyve bought! Dead Space 1 & 2 are awesome, just pretend the 3rd doesn’t exist. I hate EA, but you gotta admit that EA Access is a fantastic deal! Amazing! Same as others played 1 & 2 which were both amazing. Just got EA Access last week for Andromeda Deluxe and Titanfall 2, will give this a bash after that. who the fk has ea access lol? Why on earth would you do this? they have …who the fk has ea access lol? Why on earth would you do this? they have ruined every franchise theyve bought! I do not buy any of their games at release, but when I managed to pay £17 for a years worth of access, that's a hard deal to pass up. Worth it for titanfall II alone. True. It's a good deal but I try to avoid giving EA any money. Because it's insanely good value for money. £20 a year for access to dozens of fantastic games, many less than a year old. Yep. Shame we haven't seen any signs of DP4 though. I know it's been said already but 1 & 2 were brilliant! It has been on Origin Access for ages, I played it months ago on there. I paid for a month and finished the series back to back. DS1 was good, DS2 was great but sadly DS3 was just terrible, they turned it into an action game instead of a survival horror, it lacked any form of atmosphere and they changed the crafting system to accommodate shoehorned micro-transactions (you could buy the crafting materials with real money, and from my experience if you didn't cough up the cash you didn't have anywhere near enough to build even half of the weapons by the end). I struggled to finish it but I just had to after enjoying the first two games. Gamers who want a lot of great games at a reasonable price?